Stacy Keach is the consummate actor who totally wraps himself within the character he portrays so that audiences forget who the actor is and just see the character. Yes, actors are supposed to do that but so often when an actor portrays a celebrity you see an actor portraying a celebrity. 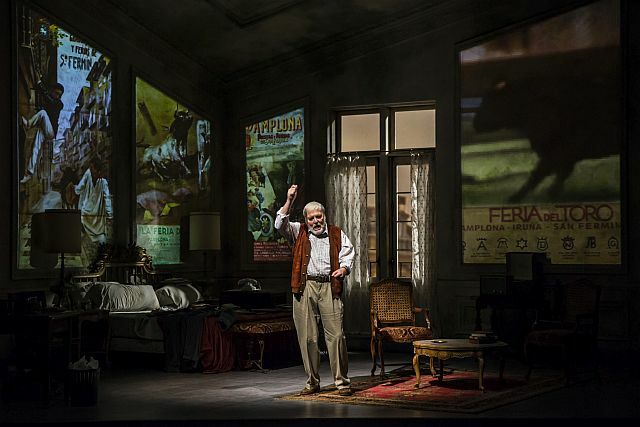 In Pamplona at the Goodman Theatre you don’t see Keach, you see Ernest Hemingway. The author is struggling with the words he wants to use to convey the feelings of the matador he is writing about for a Life Magazine article. But while trying to find the right phrase, he relives moments in his life. Projections of the “running of the bulls and the Paris of Gertrude Stein and Scott Fitzgerald flash across the walls of his hotel in Pamplona, Spain. You meet his first love, his wives, his parents through snapshots of people who influenced him and moved in and out of his life. You learn a bit about what led to “The Sun Also Rises,” The Old Man and the Sea,” Farewell to Arms,” how he hated his mother and his regrets over how he treated his wives and his father. Certainly, it is difficult to portray the life of “Papa” Hemingway in 90 minutes but by the time Stacy Keach takes his bow you feel you and this author from Oak Park, IL have become better acquainted. There is a PS to this production. It was on the Goodman schedule more than a year ago and had an excellent preview. But during the official opening night, it became obvious to those of us in the audience that Keach was ill. Director Robert Falls stopped the performance. It turned out that Keach was suffering a minor heart attack. Following bypass surgery and a recovery period, Keach returned to his TV work and has now returned to continue Pamplona. Hemingway would have understood that kind of determination. DETAILS: “Pamplona” by Jim McGrath and directed by Robert Falls is in Goodman Theatre’s Owen Theatre, 170 N. Dearborn St., Chicago, through Aug. 19, 2018. Running time: 90 minutes, no intermission. 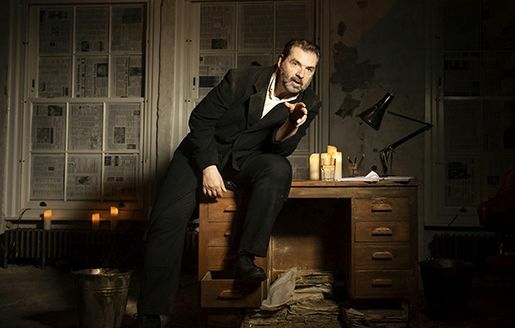 For tickets and other information call (312) 443-3800 or visit Goodman Theatre.